Simulation of a star cluster starting from clumpy initial conditions. Includes the effect of mass loss from the stellar evolution. 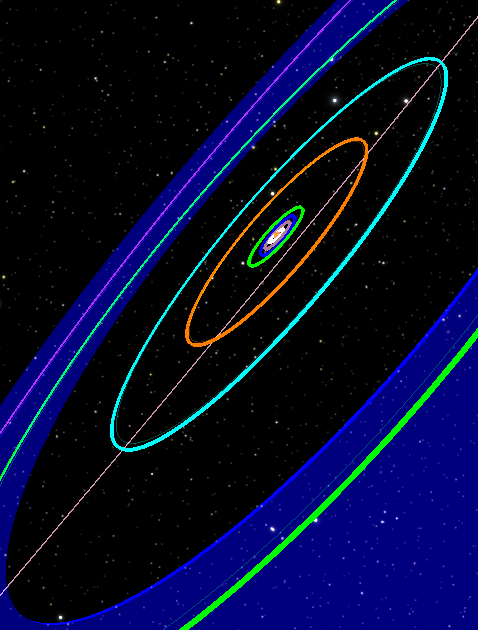 Simulated using AMUSE. Rendered as you would see it with the Hubble Space Telescope, if it would snap a picture every 31250 year, that is! Evolution of the Pythagorean triple system of 3 objects with relative masses 3, 4 and 5, positioned on the corners of a triangle with coordinates (1, 3), (-2, -1) and (1, -1) in the $(x, y)$ plane. The equations of motion have been integrated until the system dissolves using two different integration methods. The red stars are integrated using a 4th order Hermite predictor corrector method (which conserves energy to 1/1011). The black stars give the converged solution (energy conservation better than 1/1016) and with 3 decimal places accurate irrespective of the time step or the length of the mantissa) using the Brutus integrator (see ​http://adsabs.harvard.edu/abs/2014ApJ...785L...3P). Both codes are available via the AMUSE software environment at ​http://www.amusecode.org. Evolution of a proto-planetary disk around Kepler 16. Movie shows the evolution of a disk with a mass 0.01 solar masses around a binary system with stars of 0.7 and 0.2 solar mass. The simulations show that the location of density enhancement at the inner rim matches the current orbits of Kepler 16 and similar systems, published in ​http://adsabs.harvard.edu/abs/2013MNRAS.429..895P. How the Sun Captured Sedna ​http://adsabs.harvard.edu/abs/2015arXiv150603105J. Animation of the encounter between the Sun (blue) and Q (red) both with planetesimal disks. The Sun captures the Sednito's whereas Q captures some of the Sun's Kuiper belt objects. Unbound objects turn gray. The orbital elements (semi-major axis, eccentricity and inclination) are presented in the right panels. The diamonds give the known Sednitos. A simulation of the ​ the Late Evolution of Our Solar System by Aaron Geller.